One of the more dubious aspects of my wanderlusting is that I do it alone. This is not by choice, though I admit there’s something to be said for having complete freedom to go wherever you wish (that you can get to.) None of my kids share my wanderlust, and my wife has a work schedule that rarely permits her to come along. And I’ve not yet found a friend who is willing and able to join me on a regular basis, except Bruce Rabe maybe once a year or so for an excellent adventure. I try to minimize the risk by leaving a detailed flight plan with Cindy and taking a cell phone along. But, yeah, alone. Well, not quite alone. My faithful companion in these adventures is Clownie the Wonder Car. 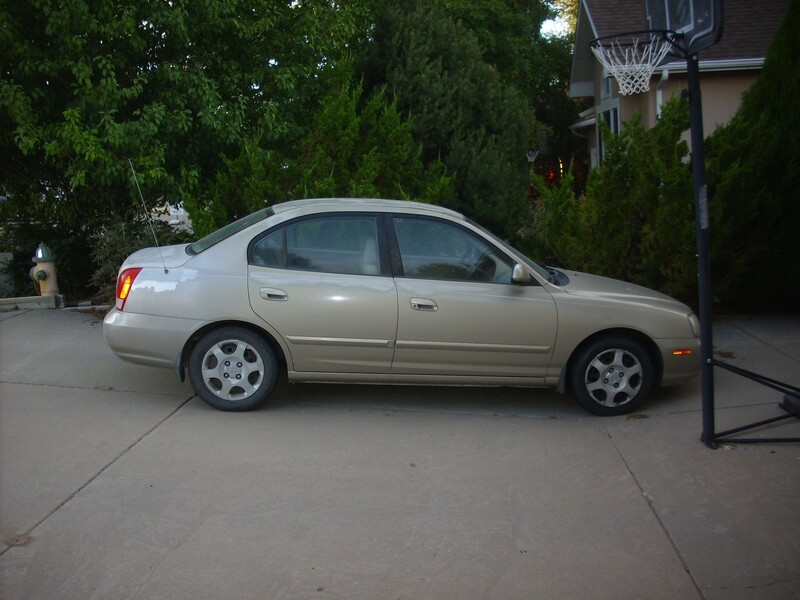 A 2001 Hyundai Elantra. She’s been a good little car, and I have taken her places you really have no business going with a small passenger car with minimal ground clearance. (Which very nearly got me stuck one time.) But at 140,000+ miles, she is showing her age. So I’m driving home from church a couple of Sundays ago, and halfway up the hill in front of Pinon Elementary School, I suddenly lose power and the engine starts running rough. The engine warning light starts blinking. Blinking, so help me. I barely make it home. I have a friend who has one of them thingumjobs that you plug into your car, and it tells you what is wrong. He brings it over, we plug it in, and … after a few moments, the reader tells me that my car isn’t speaking to it. My friend suggests we have to turn the car on before plugging the reader in. This time I get a long list of diagnostics, all pointing to cylinders 1 and 4 missing very badly. Well, shucks. Now, there are all kinds of things that can make an engine miss, but when the engine is missing badly on two cylinders, it’s a good guess the ignition system is at fault. My friend and I go looking for the distributor cap. No dice. I check online; the Elantra uses electronic ignition. Well then. Further research suggests that the ignition set may be the problem and replacing it is just within my limited mechanical skills. I have Cindy order the part. Yesterday I finally had time to work on the car. So I pop the hood, disconnect the battery, unscrew the plastic cover over the engine (no, really) and inspect the old ignition set. It’s bolted to the engine in a narrow little space with four bolts. I get out the socket wrenches and find I have no adapter for the sockets that fit the rather small bolts in question. Well, I’ve got an older set somewhere; yeah, it has the necessary adapter; I cannibalize it. (The older set I bought clear back in graduate school; the newer one I got as a reward for sticking with LANL for ten years.) Some effort, and the first two bolts come loose. The next two bolts are in a really narrow place well packed with conduits and cables. After several minutes’ effort, I figure out a way to work my hands in there and crank. The next two bolts crack loose and the ignition set comes off the engine block. First engineer friend is in France on business. His wife is a mathematician, so she probably can’t help. It starts and runs normally. No engine check light. I’ll be darned. Nevertheless, since our other car also has 130,000+ miles on it and my daughter goes to college in Idaho, I figure it’s time to get a new car. And it would have been awkward if Clownie had burned out her ignition set deep in the wilds of the Jemez. So we’ll be shopping for a new vehicle this week, and Clownie will go into semi-retirement. I’ll either sell her to some undemanding teenage driver, or keep her as a backup vehicle for driving short distances around town. I’ll likely drive to my wanderlusts this year in another hand-me-down from my wife, her old Hyundai Santa Fe. (Yeah, we like Korean cars.) Notwithstanding having 130,000+ miles on it, it’s been well cared for and is in excellent condition for its age. And it has significantly better ground clearance. That will be useful on some of the more marginal roads in the Jemez. Gonna miss Clownie, though. Amazing how attached you can get to a pile of Number 2 heavy melting scrap.